our a American airborne soldier who's job is to clear out a little village in Normandy (France). One other from Briant, different location, mixed objectives. 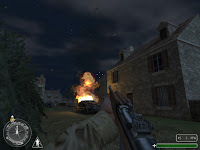 In this mission you will need to join the rest of you squad, enter the viaalge and kick out of german from the village. Design is one more time well put together, country yard, a small village, a path that will make you travel from house to house till the last occupied house the whole thing behing put together on an evening full of bomber plane under flag fire. 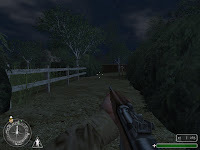 The whole map with minor ambushes, architecture design and general layout make it quite atmospheric even if it's short.